As a veterinarian, I always trust pet owners’ intuition when they suspect that something is wrong with their dog. I’ve seen some owners bring in their dog to say, “Something’s wrong with him,” even though the physical examination may be totally normal. Once blood work is done, it turns out they were right and we’re able to pick up on some early stages of disease (e.g., protein-losing nephropathy, Lyme disease, or even cancer)! So, as a pet owner, I want you to trust your gut instinct when it comes to picking up on subtle signs of abnormalities in your dog. After all, you live with your dog and can pick up on potential early signs of disease or medical problems. That said, in the emergency room, I often hear, “His nose was dry, so I knew something was wrong.” Kudos to you for observing your dog carefully, but actually, in general, Fido’s nose is not an indicator of how sick or healthy he is. Check out your dog’s nose right now. You may notice it fluctuates between slightly drier to a more soft, moist nose depending on the day, weather, and humidity. A dog’s nose usually feels wet due to the lateral nasal glands and the nasal vestibular glands producing secretions that keep it moist. There is, however, no direct correlation between the health of your pet and their sniffer (for the most part). When could my dog’s nose indicate a health issue? 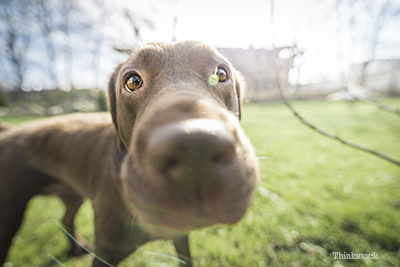 If you notice that your dog’s nose is excessively thickened, cracked, or bleeding, then that does mean something may be wrong. Some underlying skin diseases or immune diseases such as pemphigus (more commonly seen in breeds like Collies) or lupus can present this way. The difference will be very obvious. What nose symptoms warrant a trip to the veterinarian? Workup for nasal problems include blood work (to look for evidence of an infection or increase in white blood cell count) clotting tests (to look specifically for mouse or rat poisoning or platelet problems), x-rays (of the chest and nose), biopsies (done by endoscopy [a camera is placed in the nostrils under general anesthesia]), or even a catscan. The sooner you recognize the problem, the sooner it can be treated. This should help you weed out your anxieties over dry and wet noses. Can ice water make a hot dog bloat?